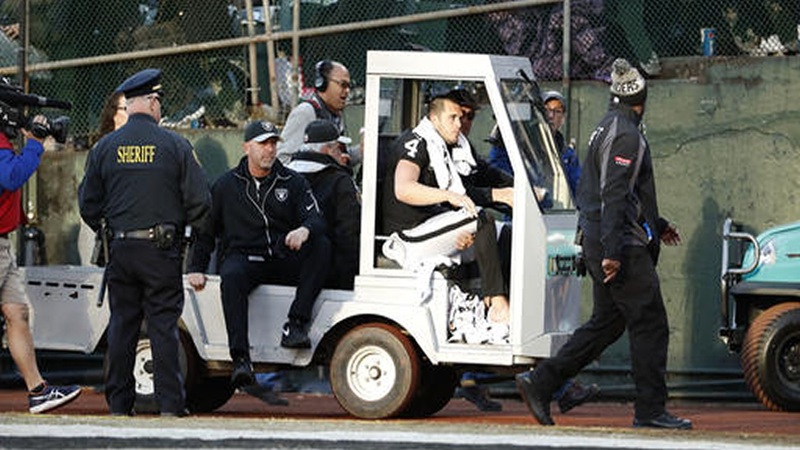 OAKLAND, Calif. (KGO) -- Oakland Raiders star quarterback Derek Carr is set to have surgery on his broken leg tomorrow. And while some worry his injury could mean the end of the team's Super Bowl dreams, the team's fans and the man in charge, aren't buying it. Derek Carr's broken leg broke the hearts of many a Raiders fan, but while their team may be down, they aren't necessarily out. And with a 12-3 record, diehard fans say, the Super Bowl is still within reach. "There's a lot going on now, we are waiting to see what happens. We still may be on that track, don't count us out. We're diehard, that Black Hole is serious," said Rodney Rushing, Raiders fan. "I was just praying, hoping he was going to get up," Alfredo Azureia, Raiders fan. Alfredo Azureia was there in the stands at the Coliseum Saturday afternoon, when Carr went down and then out for the season. "You're still confident, you think Super Bowl?" asked ABC7's Laura Anthony. "I'm ready to go, I feel great," said Matt McGloin, Raiders backup quarterback. McGloin is saying all the right things too, but it's up to head coach Jack Del Rio to make sure his players, his team, do all the right things. "It's about the team. It's about us winning. It's not in any way meant to be insensitive. But the team does carry on, that's what we do," said Del Rio. Diego Diaz is just 10-years-old, but he gets it. "You think we can still go all the way with McGloin?" asked Anthony. "We're the Raiders, we never give up," said Diaz. Click here for more stories on the Oakland Raiders.